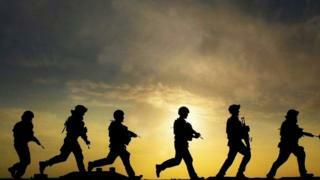 A quarter of those serving in the UK's armed forces want to quit, a Ministry of Defence survey (MoD) suggests. The rate of personnel planning to leave, or who have given their notice, increased from 16% in 2011 to 25% now. Those planning to stay in the service for as long as they could also fell from 41% in 2011 to 34% now. However, the survey of 11,877 personnel also found there had been an increase in morale, with 45% rating their morale as high, compared with 41% in 2014. The 2015 Armed Forces Continuous Attitude Survey was responded to between October 2014 and February 2015. The number of those who expressed dissatisfaction with service life rose five percentage points since last year to 32%. However, the attitudes survey indicated only 5% of respondents had actually handed in their notice. The findings come as research by The Royal United Services Institute suggested the armed forces might face £35bn of budget cuts in the next decade. Shadow defence secretary Vernon Coaker said: "The situation has gone from bad to worse over the past five years and is unlikely to get any better with the Tories' current plans. "The morale of our armed forces is of the utmost importance and the government needs to urgently address the issues that are making so many want to leave the forces." An MoD spokeswoman said: "We continually strive to ensure our people feel valued and that their contribution and sacrifice is recognised. "That is why we invest in a range of measures to improve service life, from welfare support to accommodation, while prioritising the principles of the Armed Forces Covenant. "We have been seeing results; total outflow of personnel has been falling for the last three years. "We remain on course to meet Future Force 2020 targets as we move towards the agile and flexible force needed to keep us safe at home and abroad." Why is no-one talking about defence cuts?